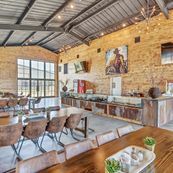 Guests are greeted by landowner or landowner representative, have the option of catered meals, guiding and know that staff is available when needed or in emergency situation. 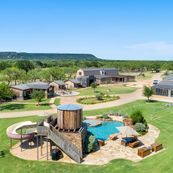 A ranch experience like no other, Rocker B offers activities for everyone while surrounded by the scenic Palo Pinto Mountains. 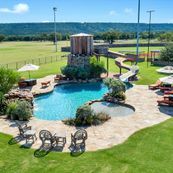 A swimming pool with 50-foot water slide, landscaped waterfall, and shallow play area is the perfect entertainment for all ages. 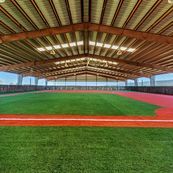 The indoor arena with a turfed baseball field offers endless weatherproof opportunities as well as a flexible event space. 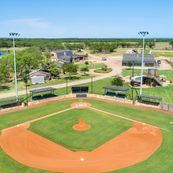 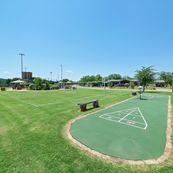 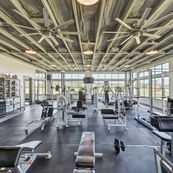 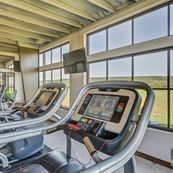 Two baseball fields, practice field, tennis and basketball court, driving range, fishing lake, workout facility, and spa insure that there's an activity for every member of your group. 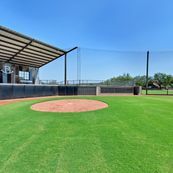 The 2,500 square foot Clubhouse and Dugout offer the opportunity to kick back and relax after a full day of fun as well as offering plenty of space to enjoy meals and downtime together. 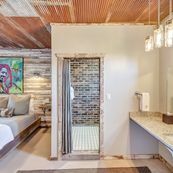 Rustic contemporary lodging accommodations offer a unique sense of privacy and are situated steps away from all the ranch activities and facilities. 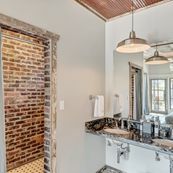 From custom built brick showers to heavenly beds, each room has been thoughtfully designed to ensure your most comfortable stay. 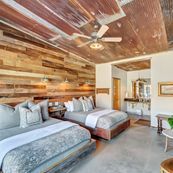 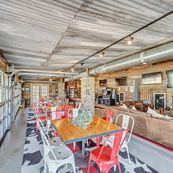 The Lodge is composed of ten private hotel style rooms and two spacious bunk rooms featuring custom made wood beds, shiplap walls, and red brick showers. 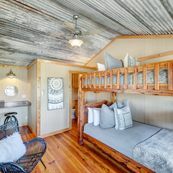 The four private Cabins each have full sized bunk beds and private bathrooms. 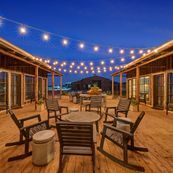 Enjoy an intimate experience and your own covered porch. 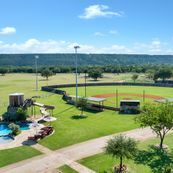 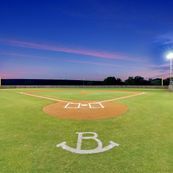 A perfect bunkhouse for kids, the Locker Room overlooks the baseball field, has sixteen bunks, two bathrooms, and lockers from TCU's locker room. 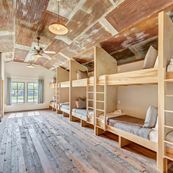 An unforgettable slumber party awaits. 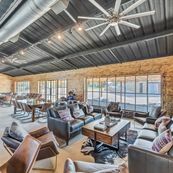 The Skybox is a secret hideaway loft and the ultimate spot to cozy up and unwind. 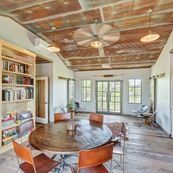 Throughout the early and mid-1800’s, the Ranch and surrounding Palo Pinto County area were almost completely inhabited by Native Americans, due to the land’s proximity to the Brazos River. 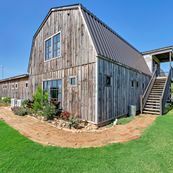 After the Civil War, cattle left behind by Spanish settlers roamed on the open range, free for the taking, leading to the exploits of famed Texas cattlemen, Oliver Loving, Charles Goodnight, and Marcus Dalton. 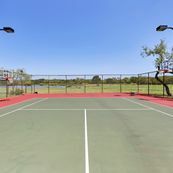 In 2005, the property was acquired by Fort Worth businessman, Lance Byrd, and his wife, Lauren. 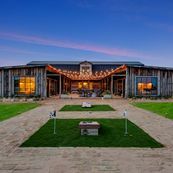 After an early venture as a working cattle and cutting horse family ranch, the Byrd family redirected their efforts in 2015 towards developing the Ranch into a premier resort destination. 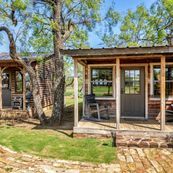 Today, the boomtowns and Indian campsites are long gone, but Rocker B Ranch continues to be a place for families and friends to experience the breathtaking views of the Palo Pinto Mountains that Spanish settlers, Native Americans and famed Texas cattlemen once gazed upon. 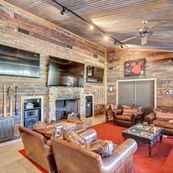 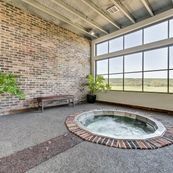 "With our unique facilities and abundant activities, Rocker B Ranch is the perfect venue to host the event of your dreams!"